Derek Cianfrance made a name for himself with Blue Valentine, a film that chronicles the rise and fall of a marriage. 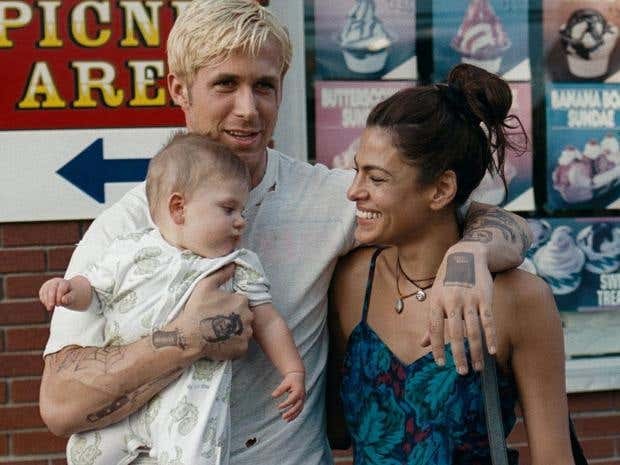 The Place Beyond The Pines – the filmmaker’s latest – tells the story of sons and fathers. Once again, Cianfrance zooms in on family relationships, and shows us the not-so-pretty picture. While talking to the director, we learned that he’s been telling family stories since he was a young boy. He also told us about casting Bradley Cooper and his excitement for an upcoming ‘dream’ project. After making The Place Beyond The Pines, do you think we can escape the sins of our fathers? Derek Cianfrance: Well that’s the whole nurture/nature debate. I’m not a message filmmaker. I try to make movies that present questions and provoke or instigate. I like to hear the discussion that comes from it. I will say that Jason [Dane DeHaan], the main character of the movie, is surviving at the end of the film. To me, it’s a very Darwinistic film. It’s about survival of the fittest and the only way to survive is to evolve and move forward. Now, is he still his father’s son? Yes. Is he still cut from the same tree? Yes. But is that ring of the tree like one more ring wider? Yes. It’s growth. I do believe in growth. I do believe that my kids will be better than I am. Blue Valentine was a brutally honest portrayal of a crumbling marriage. You have a knack for showing characters as real people. When did you realize you wanted to tell it like it is? Derek Cianfrance: I have always been doing that since I was 6-years-old. I remember always being confused why we had all of these smiling pictures of my family in my house. I came from a good house; my parents were great. But we weren’t sitting around smiling all the time. I just thought it was weird that we were putting this image out to the world. I thought, why not be who we are? I remember being at a friend’s house and hearing his parents beat each other up upstairs and also seeing those smiling family pictures of his family on the walls. I was thinking it was a farce. When I was a little kid, I was always trying to take pictures of people fighting. I have pictures early on of my brother in his underwear with tears streaming down his face, and my mother standing over him screaming. You can tell how young I was by the perspective… it’s like a real low angle shot. I was always doing that. On our trip to Disneyland, one time, my dad blew a tire in the middle of the Arizona desert and he was on the side of the highway with cars driving by at 75 mph. He’s changing the tire, and he was so mad at me for photographing him. I’ve been trying to make my feature films feel like home movies in that sense. Families are places of great secrets and intimacy. Cinema is also a place of secrets and intimacy. I love siting in that dark room with strangers and watching these shared private moments on the screen. Often times when I see movies, I see this prevalence of profession on the screen. These characters that are created in marvel, like in the image of gods on the screen. Often times when I leave movies, I feel like, where do I fit in? I feel like it’s that same thing. It’s that smiling family portrait. It just doesn’t feel relatable. So all I’ve been trying to do with my films is make portraits of people that I recognize, and people that I’ve seen in my life. I have never met a hero in my life. I’ve never met a villain. I’ve met a lot of people living in the grey area. My world is very black and white. I think love and hate are intricately intertwined. Those are the types of films I’ve always been drawn to. You like to be surprised by your actors. You like the mistakes they make. What are your sets like? Do you randomly call action to catch them off guard? Derek Cianfrance:I’m not trying to get gotcha moments. I work with so much love. I lead with love and I’m always asking people to be brave and I support them. When they make mistakes I just love them so much for it. I’ll celebrate their mistakes, more than than I’ll celebrate their successes. I want them to feel like that. I definitely think it’s very exhausting doing the movies. Just like with my scripts, I’m trying to find a place where fiction and non-fiction collide; where reality and fantasy collide. With my actors, I’m trying to film a place where they, themselves as human beings, collide with the character that they’re playing. I’m not looking for acting, I’m looking for behavior. All of the actors I’ve worked with have had great experiences on sets, making the films, their real experiences that they have. Did you know Bradley Cooper before casting him? How did he end up in Pines? Derek Cianfrance: I didn’t know him. I knew Ryan [Gosling] was going to be Luke for five years. I had no idea who was going to play Avery. I was meeting a bunch of actors. One of the meetings that my producer set up for me was with Bradley Cooper. I was like, Bradley who? That guy from The Hangover? And I was like, ‘Arg, okay, I’ll meet with him.’ But I didn’t think there was much a shot of him being in the movie, but I was meeting everyone so I went to see him and immediately I was just struck with him. Just the way he was sitting… I could still see it. If I had to put a visual image on who he was – it was like a pot of welling water with a lid on it. There was a storm inside of him. But on the outside, he looked perfect. He looked like People’s Sexiest Man. When I started to talk to him, I realized he was a guy who was wrestling with so many of the things that I wrestle with as a man. After leaving that meeting, I was so struck by how wrong I was. My perception of him was very different. I rewrote the character of Avery specifically for him based on that idea of this guy who was walking around life and everyone thinks he’s a certain guy but inside he feels corrupted and ashamed. He’s got this toxic shame that’s rotting him out. I thought it could be really interesting for an audience to have that same experience with Bradley that I had. So I rewrote the script for him. When he first read it, it spooked him. He said that he didn’t think he could do the movie. I said to him, ‘Where are you right now?’ He says he’s in Montreal shooting The Words. I said, ‘Okay that’s about five hours from Brooklyn, I’ll be there at 11 o’clock tonight, we’ll talk about it.’ So I drove up there and we had a dinner from midnight to four in the morning. Basically, he was out of the movie the first three hours and 45 minutes of the dinner. It wasn’t until the last 15 minutes that I was able to convince him. I told him that I wouldn’t make the film without him. Once I met him he was the only person that could play that role. How did the filmmaking process change from Blue to Pines? Did it get easier? Derek Cianfrance: Blue Valentine gave me opportunities to not have to wait another 12 years between films so I’m very thankful for that. This was definitely a more difficult film to make than Blue Valentine because I put all of those 12 years of struggles into a six year period. Everything about this movie is extremely challenging. Everything that we’re doing in the film – the structural changes, the 15 years of time we’re telling, the three stories, the 56 speaking roles – everything was amplified from Blue. It was epic scale. It was a 47-day shoot where Blue Valentine was a 23-day shoot. It was pushing the boundaries. I was interviewing Danica Patrick some years back, and I asked her, how do you go fast? How’d you get so fast? She said that her whole life she always knew how fast she could drive… ever since she was a little girl driving go-carts. What she would always try to do was drive to her limit, to her boundary and then she’d drive a little bit faster to the point where she could risk crashing. She would crash, but she said that that was the only way you could get faster. For me, making Brother Tied when I was 24-years-old. I had that thing that all filmmakers have which is the Orson Welles goal, which means you have to make a movie by the time you’re 26. If you don’t, you have Orson Welles’ shadow over you your whole life. I had that ambition to make it and I didn’t make it. I had to go sit on the bench for all these years. It was a way for me to get better. After I didn’t have that success in my first film, I wasn’t going to be that rock star filmmaker. So the next thing I could do, which is more fulfilling and satisfying, is trying to aim for longevity in my life. I’m trying to make my best film when I’m 70 or maybe 80. There’s a lot of dangerous stunt work and chaotic camera shots. How difficult were those scenes? Derek Cianfrance: All of those scenes where incredibly difficult because you’re putting people’s lives on the line. Knowing some history, I think about Vic Morrow quite often, you know, and I don’t want to repeat that. I want everyone to be safe, but I also want it to be dangerous. I want the viewer to feel danger or safety. There’s a fine line you have to walk. Those scenes we shot for a long time. Ryan had to train on a motorcycle for eight weeks to be able to do the stunts that he did in the film. I remember on the first day of his stunt driving I asked Rick Miller what level he had gotten to, and he said a three. And he said that the most he would get to would be a three or a four. He said that learning takes a lifetime, it’s like playing in the NBA, you have to start shooting hoops since you’re six. I told them he had eight weeks. So at the end of eight weeks I asked Rick again where did Ryan get to, and he said he was a seven. Those are the kind of actors I had in this movie. They were people that could do what normal people couldn’t. So I just shot the film in the way I wanted to. You’re working on a TV show for HBO called Muscle. It’s an adaptation of Sam Fussell’s memoir about an Oxford graduate who moves to New York City and spends years in the world of bodybuilding. It sounds like the perfect story for you. Derek Cianfrance: Muscle is a dream project for me. We can redefine characters in real time on the screen. I’m all about process as a filmmaker, and the great thing about Muscle is that we can show the audience the process. I feel like people are interested in the process. That’s what I love about Muscle, that It blurs that line between my filmmaking process and the story we’re telling. The Place Beyond The Pines opens in select theaters March 29.